PGI Charity Showdown, where forty top video game broadcasters from around the world and forty of the most elite PlayerUnknown’s Battlegrounds (PUBG) pros on the planet will team up and battle it out across four intense matches to be livestreamed on https://www.twitch.tv/playbattlegrounds to claim a piece of the $1 Million USD prize purse to donate to the charity of their choice. Taking place on Friday, July 27 starting at 7:00 am Pacific Time, live from the Mercedes-Benz Arena in Berlin, Germany during the PUBG Global Invitational 2018 (PGI 2018), some of the biggest personalities on Twitch, including Ninja, Shroud, Dr DisRespect, Moondye, Rubiu5, Willyrex, Sacriel and more are set to stake their claim for the prize. 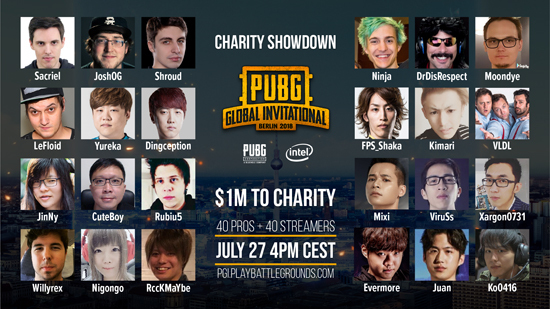 Fans around the world can tune in to the PGI Charity Showdown on July 27 at https://www.twitch.tv/playbattlegrounds. Starting at 7:00 am Pacific Time (4:00 pm CEST), PGI 2018 attendees that have a ticket to any single day of the tournament can attend in person at Mercedes-Benz Arena at no additional cost. Check out pgi.playbattlegrounds.com for all the details. The stage is set, as 20 of the top professional PUBG esports teams from around the world will compete at PGI 2018 from Wednesday, July 25 - Sunday, July 29 for the ultimate title of PUBG World Champion. Fans can tune in to watch all of the action from PGI 2018 at https://www.twitch.tv/playbattlegrounds. More information on PGI 2018, including ticket sale details, onsite events, and more can be found at the PGI 2018 official website (pgi.playbattlegrounds.com).